Heather Leopard: That's My Name, Right There on the American Crafts Blog!!! That's My Name, Right There on the American Crafts Blog!!! So it's been 2 - 3 days now since I got the email and I still have butterflies just thinking about this announcement. I know it sounds ridiculous but I am just THAT excited! 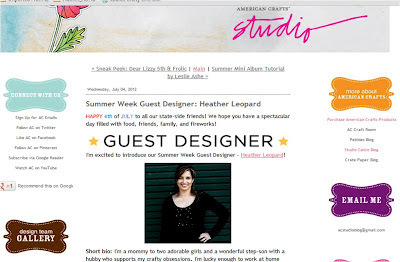 If you follow my blog, you probably saw that I was a guest designer for American Crafts earlier this month. Did you see the projects I created? It was such an honor and I was so excited to see my name and photo on their blog that I took a screen shot of it. I had no idea at the time what I would use it for. I am joining the team with some of the most amazingly talented ladies, many of whom I've admired for so long and several of whom I've had the chance to design with! Heather Leopard - from Cypress, TX <----- That's ME! Make sure to head over to the American Crafts blog to see the official announcement and new CHA releases! Oh and you know I'll be taking a screen shot of the AC blog today! I might even scrap it! Thanks so much for celebrating with me! You must be grinning from ear to ear! Congrats! way to go Heather, im so happy for you! Super excited for u Heather - Cingrats! Can't WAIT to see all of your creations that will be made using American Crafts!! BIG CONGRATS!!!!!! So deserved! Welcome to the team! Yeah! I LOVED what you did with your guest projects, can't WAIT to see more of your gorgeous work for this team! Welcome to the team! CONGRATS, Heather!!! I am so excited for you and to work with you! Woo Hoo! Now that's a happy email to be sure :) Congrats! Hi Heather....I am checking out the 3 TEXAS girls...you, Becky and Leslie. Look forward to following the three of you with AC.Congratulations. I am SOOOO flippin' excited for you!!! This is just AMAZING!! Congrats! I can't wait to work with you! American Crafts Guest Designer - Oh yea!